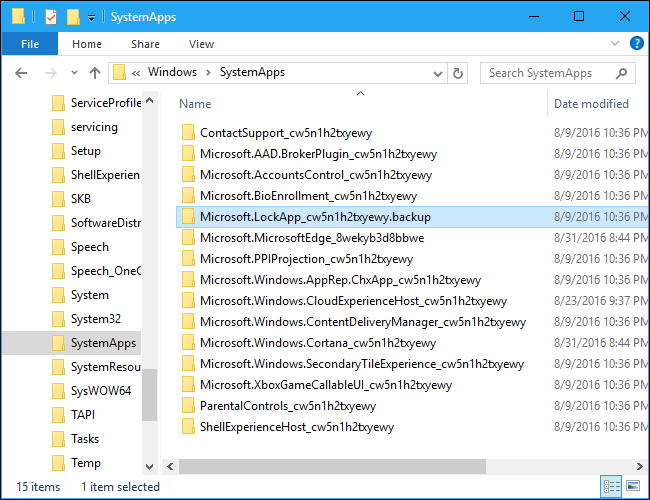 With Windows 10’s Anniversary Update, Microsoft no longer lets you disable the lock screen using a group policy setting or registry hack. But there are still workarounds for now. The group policy setting that disables the lock screen is still available, but it only works on Enterprise and Education editions of Windows. Even Windows 10 Professional users can’t use it. Follow the instructions below and you’ll only see the lock screen once: when you boot your computer. The lock screen won’t appear when you actually lock your computer or it wakes from sleep. If you put your computer to sleep or hibernate it, you’ll never see the lock screen at all. We’ve seen a variety of ways to do this online, involving everything from the Local Security Policy editor to the Task Scheduler. But the easiest way to do this is by simply renaming the “Microsoft.LockApp” system app. To do this, open File Explorer and head to C:\Windows\SystemApps. Locate the “Microsoft.LockApp_cw5n1h2txyewy” folder in the list. If you ever want to restore your lock screen, just return to the C:\Windows\SystemApps folder, locate the “Microsoft.LockApp_cw5n1h2txyewy.backup” file, and rename it back to “Microsoft.LockApp_cw5n1h2txyewy”. With the LockApp folder renamed, Windows 10 won’t be able to load the lock screen anymore. Lock your computer and it will go straight to the login screen where you can type a password. Wake up from sleep and it will go straight to the login screen. Unfortunately, you’ll still see the lock screen when you boot your computer–that first lock screen seems to be a part of the Windows shell. This works very well. There’s no error message or any other apparent problem. Windows 10 just goes straight to the login screen because it can’t load the lock screen first. Microsoft will probably break this tweak in the future. 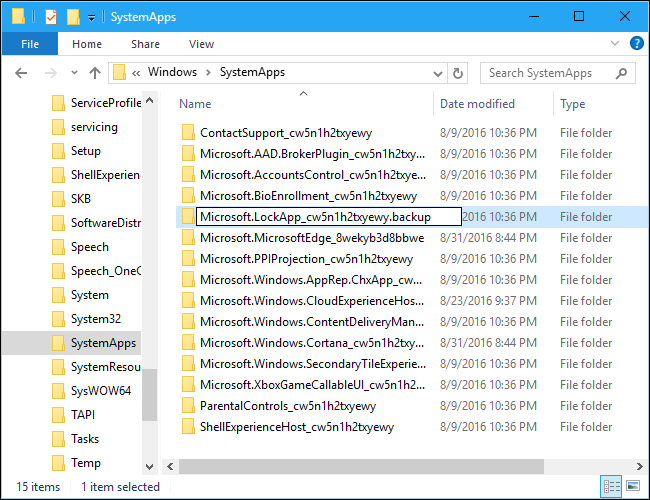 When you upgrade to a new major build of Windows 10, an update will likely restore the “LockApp” folder to its original place. You may need to rename the folder again in the future if you start seeing the lock screen again. If you’d like to get past the lock screen even when booting your computer, considering having your computer automatically sign in when you boot it up.. Your computer will automatically sign into your user account and you won’t even have to enter a password when it boots. There’s a potential security risk to logging into your Windows PC automatically, though. Don’t do this unless you have a desktop PC located somewhere secure. If you carry your laptop around with you, you probably don’t want to have that laptop automatically sign into Windows. The old netplwiz panel will let you enable automatic login on Windows 10. Press Windows+R on your keyboard, type netplwiz , and press Enter. 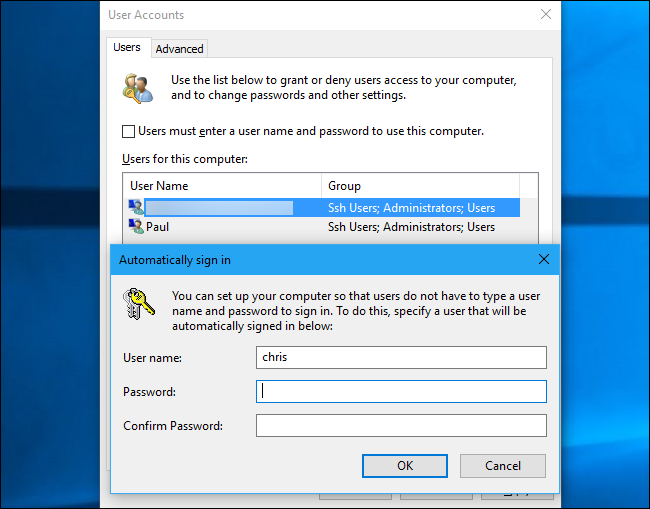 Select the account you want to automatically sign in with, uncheck the “Users must enter a user name and password to use this computer” option, click “OK”, and enter the password for your account. Windows will store it in the registry and automatically sign into your computer for you when it boots.